Kathyrn Davis' 6th novel examines a cross-section of humanity in a bevy of people (and a number of animals) in a town steeped in Americana. This book is hard to characterize. It's about three girls/friends coming of age; but it's not Chick-Lit. It's about one of those girls being able to bring people and animals back to life; but that's really just incidental to the story. It gives the hyperactive, mischievous thoughts of dogs; it has a resolute beaver that never loses hope even when caught in a trap; and there's a feline who tests the saying, "Curiosity kills the cat". But this isn't Dr. Doolittle. It has a 92-year-old lady still full of life, but this isn't On Golden Pond. There's not much of a plot. It's more of a snapshot of a small New Englandesque town (although the exact location of it is never really given). With about 50 pages to go, things start to build towards a climax, but even that is ...um... anticlimactic. If you're seeking for swashbuckling action, look elsewhere. There are a lot people who, for some reason, expected The Thin Place to have a spiritualistic overtone - good-vs.evil; demons & angels; etc. True, there's a bit of that here, but this is more mystical than metaphysical. Finally, this is not an easy read. The story demands your full attention, as it swirls from one being to another in almost random fashion. Clive Cussler fans should avoid this one at all costs. There's no middle ground. 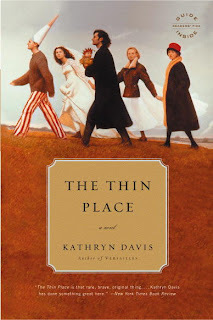 You'll either love The Thin Place, or give it up after 50 pages. It reminds me of Waiting For Godot, but instead of witty dialogue to substitute for a plot, Ms. Davis treats you to some beautiful writing. This is an excellent book for a quiet evening with New Age music playing in the background. But don't try to read it while watching TV. What if you don't like New Age music? Are you still allowed to read it? Jason - yeah, one can dispense with the New Age schlock. but i wouldn't put on NIN's The Downward Spiral as b'ground music for this one. Amanda - the characters were interesting for me. but there are a lot folks who felt otherwise. i took a chance on this one because it was only 275 pages long. i'm OCD, so i have to finish any book i start. that makes me shy away from the likes of Tolstoy, Hawthorne, or Milton. i can just about guarantee that any 'classic literature' that i read/review will be less than 300 pages long. Very rarely will I put aside a book I've started. I'm not terribly OCD, but I do have the drive to keep going with a book unless it's so awful I just can't stand it (like Lady Chatterly's Lover). With this book, would you classify it as modern fiction or modern lit? I dunno, nothing says "I focus on the pain, the only thing that's real" like a talking beaver. I like long books, but I am not shy about getting lazy and quitting halfway through either. My best friends are all long books, they're the ones that can listen to you in any mood. It would probably be better if I was MORE shy, as a general rule. hmm. i don't know the difference between the two, but i'd lean towards calling it "modern lit". the story itself isn't memorable. but the author's style of telling it is. ROTFL, Jason! actually, none of the animals talk here, although one of the dogs apparently communicates telepathically with the dead-raiser girl. the beaver snores, swims on his back, and slaps his tail. but mostly he does the beaver thing. every night, he builds his dam and stops up the pond. every day, the humans un-stop the dam by destroying the dam and setting traps. in the end... well, no spoilers here. I'd say the difference between fiction and literature would be the intent in the book. If the book is meant purely to entertain, it's fiction. If it's meant to address the "human condition" as they say, it's usually classified as literature. This of course does not apply to genre fiction which has its own rules, and the lines do get blurred.